Old San Juan, Puerto Rico - Beach accessed by steps across from capital building, along fort wall (Playa Ocho). This beach was amazing, we found pieces of all sizes and colors, even a marble! We have never found such an abundance of glass on a single stretch of beach. Wow! 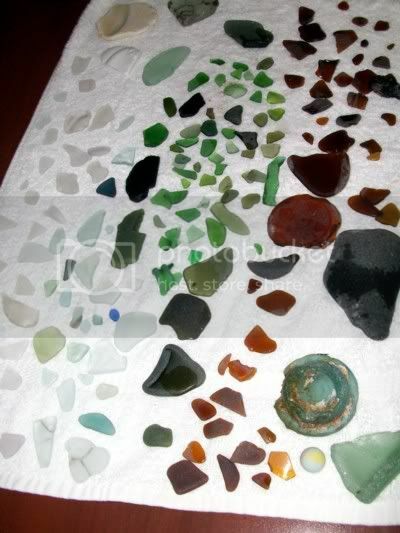 Thanks for submitting this report on the sea glass in San Juan, Rebecca. We had heard of sea glass in San Juan but not a first-person report. It's logical with the city built on the bluffs that a lot of sea glass would end up on the shoreline, especially with a fort there. Not only that, but the age of the city, established in the 1500s, a lot of old glass possible. It's interesting that the island is called Puerto Rico, which means "Rich Port" in English. Well, apparently the name of the town and the port was originally "Rich Port," which is logical, and the name of the island was San Juan (Saint John), which fits right in with the names of many other Caribbean islands named after saints...Saint Kitts, St. Maarten, Saint Lucia, etc. At some point in history, somebody along the line, probably a mapmaker back in the old country, got the names switched, and the port town became San Juan, and the island became "Rich Port," Puerto Rico. well as in many other tropical and historical delights. During the Spanish colonial times most of the town's inhabitants lived in what is now known as Old San Juan. This area is located on the western half of a small island called the Isleta de San Juan, which is connected to the mainland by two bridges and a causeway. Following World War II, San Juan became a travel destination for vacationers, paving the way to the huge tourist industry in the Caribbean that has sprung up during the intervening years. It boasts many hotels and restaurants catering to all tastes. The climate is perfect for hunting sea glass: San Juan's climate is classified as tropical marine. San Juan enjoys an average temperature of 82 °F (28 °C) during the year, although 90 °F (32 °C) or higher temperatures are often felt during the summer, especially if the winds come from the south. In the winter, temperatures can drop to the 60s, though the average winter low is 71 °F (22 °C). If you get a chance, check out the sea glass in Old Town, San Juan for yourself! And by all means add your comments below. Although rated excellent, the photos only show a few pieces of jewelry-grade sea glass (see How to Grade Sea Glass). Let's keep in mind the economy of PR is really hurting, don't be greedy and take what you can use. Some local artisan and the local community provide for their family by working with sea glass or selling it. By suitcases. Its a shame , we need to act like visitors not like we are entitled. My husband and I are going at the beginning of May, and to be honest, beachcombing is the #1 thing I want to do! 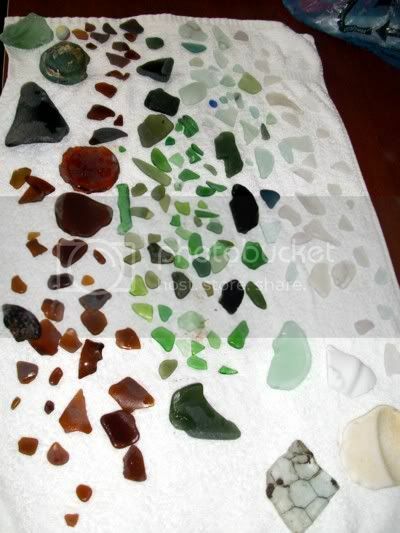 I love to hunt for sea glass, and I hope to find some treasures in PR! The access to the beach across from the capital is under construction and is closed. We paid $5 at San Juan public beach and found sea glass and pottery by the handfuls. Make sure you get there early as parking gets full fast. We went on Monday morning by 9:30am and the parking lot got full by the time we climbed out of our car. Planning trip next week to Puerto Rico! Does anyone have any recent activity for Sea glass? I'm from Southern Calif and this will be my first real adventure in looking for sea glass. There is a nice public park (admission was $4 I think) just south (west? downhill!) of where the National Park compounds starts. There is a beautiful swimming & wading area, and we found lots of seaglass easily. Highly recommend! We were warned not to go north (east?) of there because of drugusers and drugsellers, that there were gangs who have hurt, robbed and even killed tourists for coming into their "turf" along the beaches where they shoot up crack cocaine. BE CAREFUL!!! Stay in public, obvious, populated places. The locals don't care about seaglass, so there'll be plenty for you even at crowded beaches. Was there in January for my 3rd trip and always find sea glass on Sun Bay and certainly on not so busy beaches. Have never taken a walk and not found all colors and sizes of beautiful smooth glass. Sometimes the edges are sharp and get tossed back in for more tumbling. We are planning a trip to PR in mid February from Ohio where we get beach glass on Lake Erie. Thanks for the information. Can't wait to start looking. We also heard about Rincon and Vieques Island. Any comments about them? San Juan is an excellent place to find sea glass. I've been 3 times in the past 5 years and have never been disappointed.... During my last trip, I found an amazing array of color and shapes (even a piece of intense orange! ), as well as several jewelry grade pieces. Look around Old San Juan and the public beaches down from La Perla (near the stadium and the Caribe Hilton). Best to go early right after high tide; look for the rockier areas on the edges of the beach. Oh, and bring water and put on Sunscreen!